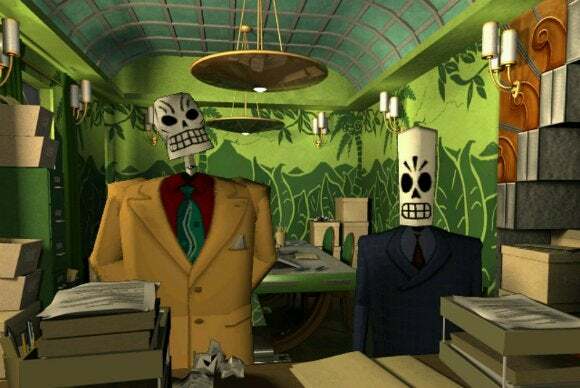 One month to the day since Sony stood onstage at its E3 press conference and announced Grim Fandango would be available legally for the first time in almost fifteen years, we get confirmation that oh thank goodness it's coming to PC also. Yes, despite the implication at E3 that this was a Sony exclusive, the game will indeed be coming to its true and rightful PC home. And Mac. And Linux. It's not really a surprise, considering Grim Fandango creator/Double Fine founder Tim Schafer tweeted about "other platforms" during E3, but still—go ahead and heave a sigh of relief. And lest you be mad at Sony for making you wait with bated breath for this announcement, keep in mind that it sounds like Sony helped Double Fine negotiate the rights to Grim Fandango back in-house after fifteen years of LucasArts squatting, sticking fingers in ears, and shouting "Sell one of the most critically-acclaimed games of all time legally again so you can actually play it? I can't hear you! I can't hear you!" while George Lucas ran roughshod over the Star Wars franchise. Ahem. Sorry. The point is that Disney is maybe the best thing to happen to Star Wars in a long time, and certainly the best thing to happen to fans of classic adventure games from the 1990s. There's still no official release date, though—today's announcement says "just a BIT longer."